Seaside Terror at Moving Parts Festival. Puppet design, Odd Ball; set design, Charlotte Stanley and Ali Allen; costume design, Naomi Parker; technical design, Matt Sykes-Hooban. 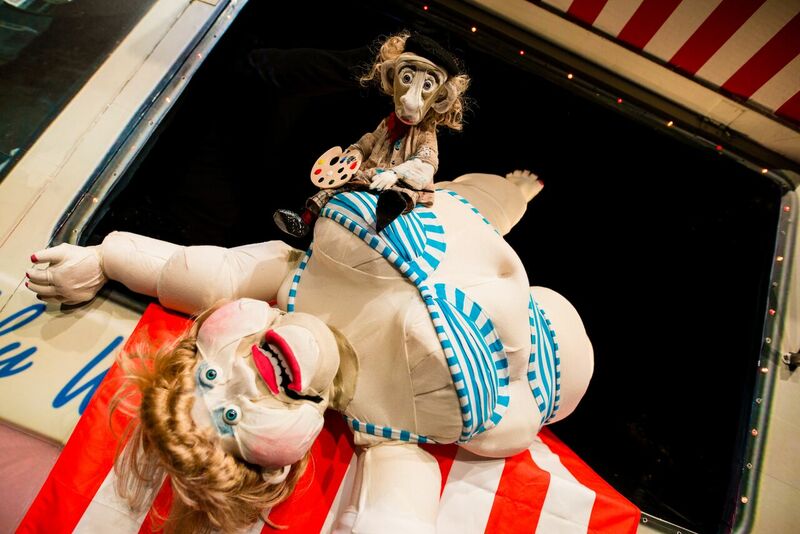 Returning after its successful inaugural run in 2017, Newcastle’s Moving Parts Puppetry Festival stretches over nine days and multiple venues. It offers a range of shows and workshops for both children and adults across the city, including a number of free family-friendly events. Both The Seed Carriers and Seaside Terror are aimed squarely at adult audiences, though they are very different productions. The Seed Carriers, an award-winning piece by Stephen Mottram’s Animata, is slow-moving and almost elegiac. A series of small, human-like creatures scuttle about a darkened stage, trying to avoid capture by a mysterious being that harvests them for their insides. An alchemist dismembers his haul and methodically weighs out the shining sand contained in each tiny body; new beings hatch from alien-looking, plant-like pods only to be snatched into servitude from birth. Created by Mottram in co-operation with composer Glyn Perrin, whose haunting score beautifully echoes the strange, sinister goings on onstage, it is gorgeous to look at and technically accomplished, and manages to be oddly moving. Although the piece has neither dialogue nor much of a narrative, the marionettes are so deftly manipulated it quickly becomes impossible not to empathise with their plight, and the ethereal, fairy-tale quality of the production makes it properly unsettling. Odd Doll’s Seaside Terror is a much gaudier affair, though no worse for it. A gleefully macabre collection of stories set in the fictional town of Southpaw, it is narrated from an old ice cream van – come for the Cornettoes, stay for the carnage – and is a giddy riot. Killer seagulls, murderous hairballs and cursed arcade machines hold perils for tourists and locals alike in a series of comic vignettes, most set in the cleverly tricked out van, which opens into secret compartments, each shining a light on a different aspect of the town. Owing an obvious debt to the absurdist humour of shows like The League of Gentlemen, it nonetheless manages not to feel too derivative. Sharp writing and smart design abound (including the programme, which is styled like a page from the Southpaw Gazette and rife with gory stories), and the production balances some genuine emotional beats (the tale of a music hall singer hit on hard times has particular pathos) with enough jump scares for the horror fans and plenty of bawdy laughs. Moving Parts Festival ran from 6th-14th April. Seaside Terror tours to Sale and York later this month. More info here.